On Monday, (20th August) we left Kathmandu bright and early to travel south by coach to Chitwan National Park. We wound along the edge of the hills, in and out of valleys, marvelling at the drop off the edge of the road, in awe and in fear! After about an hour and a half we stopped and de-boarded (I have no idea what the little town was called I’m afraid). 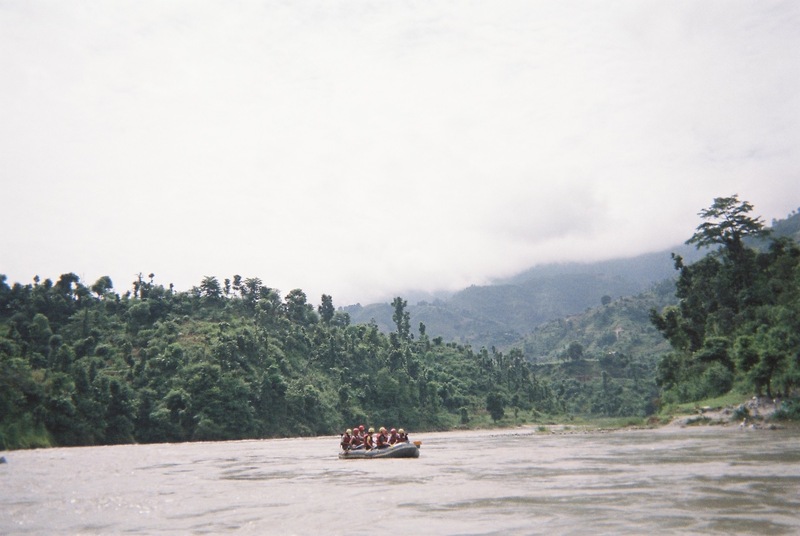 We were given helmets and life-jackets and walked down to the edge of the huge Trisuli river, swirling lazily past us. 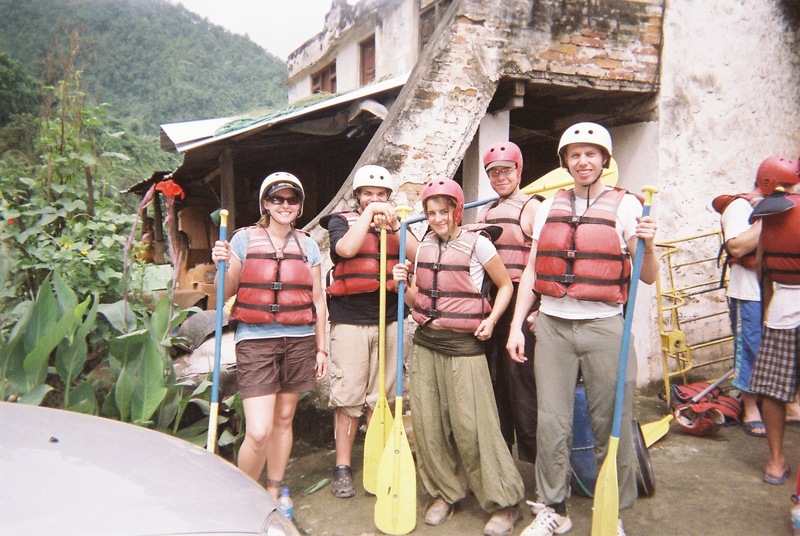 After a brief safety talk, we set off on my first ever white water rafting experience. It was spectacular and exhilirating and really quite wet! In between the rapids there were nice calm stretches so we could rest and take in the view. We rafted for about 2 hours (25km downriver) through some gorgeous countryside with hills rearing up on both sides. 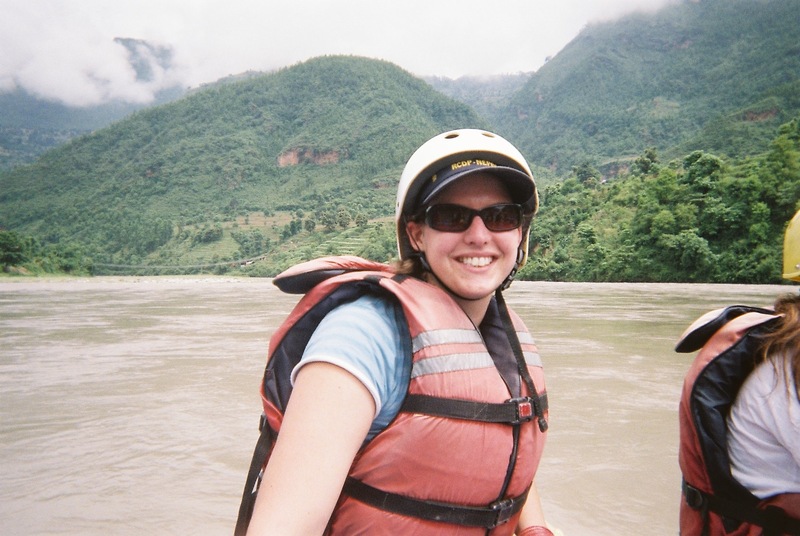 It was loads of fun, and the rapids weren’t as scary as I was expecting (although I am proud to announce that my first attempt was on a grade 3 stretch of river! Not bad for a beginner!). Our guide was really lovely, and punctuated our journey with short, sharp instructions like “full boat!” “forwa’!” “left si’ back padduh! !” “faster!” “stooooop!”. We reached our next stop (again, I don’t know the name of the town), changed into dry clothes and lunched on Dhaal Bhaat by the riverside. Then we caught a local bus to take us on to Chitwan. There were only 2 seats available, so Dom and I crammed inside while the others sat up on the roof. After an hour we were so hot and uncomfortable that we joined the others and perched on the roof-rack. Sitting on top of the bus with the wind in our hair as the temperature rose steadily was amazing, and we really got the best views from up there (I must have seen at least 15 waterfalls!). As we followed the river winding down through the hills, still buzzing from our awesome rafting experience, drinking in the incredible views, we really felt like the day could get no better. Then suddenly we emerged onto the Terai plains and the hills receeded behind us as the flat jungle spread out ahead. We entered the edge of Chitwan National Park, littered with signs about tigers, crocodiles snakes and rhinos. Just after going through Narayangarh (one of the bigger towns in the area), we saw, standing not 50 yards from the road, a rhino grazing in a field! (We have subsequently learnt that such sightings so close to a town are almost unheard of, so we were once again astounded and glad we’d been on the roof to see it!). We drove past herds of water buffalo grazing idly by the roadside, and eventually got stuck in a huge traffic jam in Sauraha. We could see smoke pouring off something up ahead, and as we were pretty close, decided to walk the rest of the way. After de-boarding the roof with a sigh (there’s really nothing like clinging onto the roof-rack whizzing down hills for a scenic view and exhilarating experience!) we walked towards what we assumed must be a pretty nasty accident. It turned out to be a student protest, and they had laid burning tyres across the road to stop traffic. A large crowd had gathered outside a house, which had 3 or 4 armed guards patrolling it. Sadly, these strikes don’t seem to have the desired effect because there are so many of them (this is the 7th or 8th we’ve seen in two weeks). The papers are full of protests, sit-ins and hunger strikes, continuously blocking roads and halting traffic. Perhaps the Nepalese people are expressing their new-found right to free speech and protest now that things with the Maoists have calmed down a bit. Who knows? What I do know is that it’s happening on such a mass scale, with almost every group imaginable staging a protest and making demands every other day, so people aren’t really inclined to pay attention and see it all as an inconvenience. Maybe I’m wrong, but that’s certainly the impression I’ve gotten after two weeks. A bloke in the paper is 9 days into a hunger strike to protest attacks on the media, but apparently no-one’s listening. I can’t help but wonder how long he’ll last for. Anyhoo, we arrived at the Alkar Resort hotel, exhausted and happy at around 5.30pm. 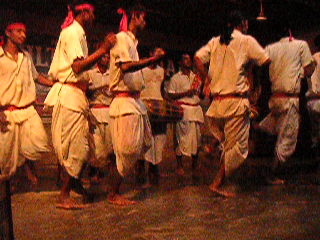 We had dinner at 7pm, and were astounded to discover that our day was not yet over, so we walked up to the village for a cultural dance show. 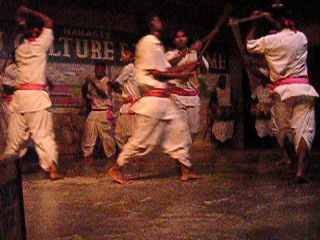 It was an all-male dance troupe dressed in white shirts and sarong-trousers with very ninja-esque bandanas and belts. They performed traditional warrior dances with sticks and drums, although the effect was spoilt slightly by the football shorts you could see through their sarongs – little flashes of England or Man-U logos as the danced round! My favourite was an elderly drummer (looked like a skinny Morgan Freeman) proudly sporting a white vest with “ENCLAND” across it! Surely we couldn’t pack more fun and excitement into one day, but as we wearily dragged ourselves back to the hotel in the dark, we heard a soft grunt, and saw an elephant, not 5 metres from the road, munching hay quietly in a barn. As lightening flashed over the hills and thunder rolled in the distance we were suddenly showered in little sparks, flashing on and off around us. We were, of course, walking through a swarm of fireflies, and they were magnificent. It was a day of firsts – my first rafting experience, first wild rhino sighting, first time on the roof of a bus, and the first time I’ve ever seen fireflies. The perfect end to the perfect day, and if I died tomorrow, I would die happy and completely content. Blissfully drifted off to sleep (at only 9.20pm!!! It feels like days since I got up this morning in Kalanki!) ready for tomorrow’s busy schedule of elephant riding and canoeing. ps – I’ve never used the word “thrilled” and truly meant it before today. Everything we did was exciting and fun and new. I am truly thrilled.